The idea is based on a gist by @jimbojsb. You can use Pygments or Highlight. Start the Automator, File - New, choose Service. 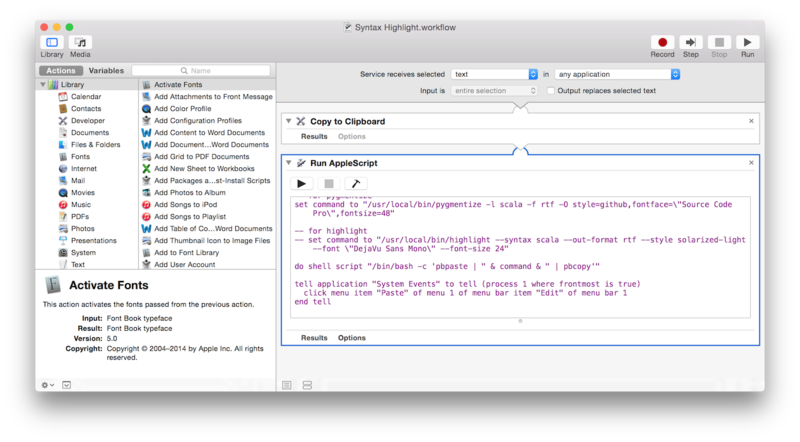 Add Copy to Clipboard, then Run AppleScript. set command to "/usr/local/bin/pygmentize -l scala -f rtf -O style=github,fontface=\"Source Code Pro\",fontsize=48"
-- set command to "/usr/local/bin/highlight --syntax scala --out-format rtf --style solarized-light --font \"DejaVu Sans Mono\" --font-size 24"
do shell script "/bin/bash -c 'pbpaste | " & command & " | pbcopy'"
Save the service as Syntax Highligh (or a different name). 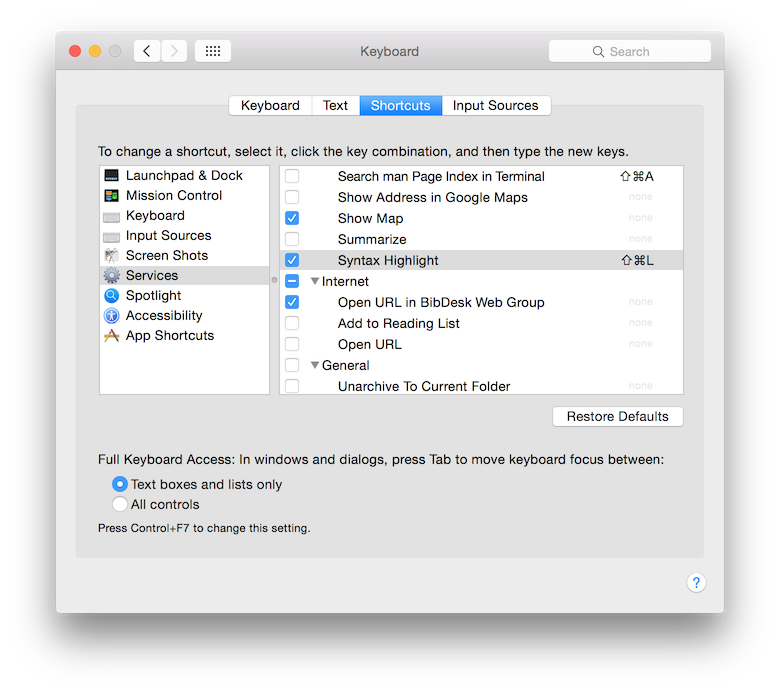 Go to System Preferences - Keyboard - Shortcuts. Under Services, look for your new service and add a shortcut. 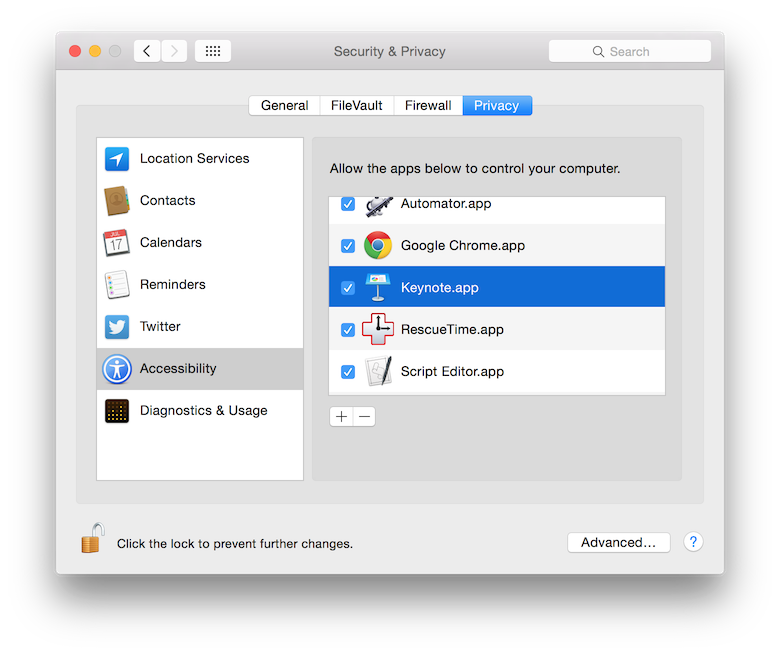 Go to System Preferences - Security & Privacy - Privacy. Under click the lock on the bottom left. Under Accessibility, add Keynote (or PowerPoint) to the list of apps. In Keynote, create a text box and add some code. Select the code and hit your shortcut. That should replace the text by its highlighted version. For the record, PowerPoint 2016 does not enable "Text" services, even when a text box has the focus. For compatibility with PowerPoint create the service with "Service receives: no input" and use a "tell application..." command to perform the "Copy" (similar to how "Paste" is performed). This sets the service type to "General", thus making it available to PowerPoint. do shell script "/bin/bash -c 'pbpaste -Prefer ps | " & command & " | textutil -stdin -stdout -format rtf -convert rtf | pbcopy'"